Magnesium Stearate - What is it doing in your supplements? Magnesium Stearate - what is it? Why do so many companies add it to their supplements? What are the pros and cons of magnesium stearate? Some common questions and misperceptions are addressed. Magnesium stearate is a white substance, solid at room temperature, used in the manufacture of pharmaceutical and supplement tablets and capsules. It is composed of magnesium and stearic acid, and oftentimes, palmitic acid as well. 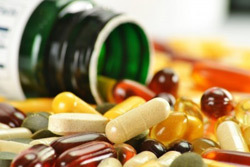 The primary role of magnesium stearate in supplements is to act as a lubricant to prevent tablet and capsule contents from sticking to the machinery that processes them. This ensures that production machinery can operate at maximum speeds and profit targets can be met. In other words, it is primarily used for financial reasons. Read a detailed explanation of magnesium stearate’s role as a lubricant in manufacturing facilities. The pros are for manufacturers that want to improve profit margins. It is far more costly and time-intensive to produce supplements without magnesium stearate. It is commonly noted in medical literature that magnesium stearate increases the time it takes for tablets and capsules to dissolve due to the film it forms on capsule or tablet ingredients. Magnesium stearate coats a good portion of the molecules in a tablet or capsule, requiring digestive enzymes to break down the magnesium stearate coating before being able to access the nutrients it envelops. In a study published in the journal Pharmaceutical Technology (April, 1985), the percent dissolution for capsules after 20 minutes in solution went from 90% without stearates to 25% with stearates. In other words, stearates reduced the rate the capsule dissolved by 65%! This may result in the nutrients not dissolving in the appropriate section of the intestines as intended. We are particularly concerned about individuals with impaired digestion who may have more difficulty absorbing nutrients coated with magnesium stearate. Are There Metal Catalysts in Your Supplement? Hydrogenated oils are a common source for the magnesium stearate used in pharmaceuticals and supplements. The stearates are made by hydrogenating cottonseed or palm oil. Cottonseed oil has the highest content of pesticide residues of all commercial oils; cotton crops are heavily sprayed. In the hydrogenation process, the oil is subjected to high heat and pressure in the presence of a metal catalyst for several hours, creating a hydrogenated saturated fat. Hydrogenated vegetable fats contain altered molecules derived from fatty acids. According to Udo Erasmus in Fats and Oils, the metal catalyst used in the hydrogenation process may also contaminate the stearates produced. “Live to be 150…Can You Do It?” was a recent ABC News/Barbara Walters special that featured scientists talking about stunning new research on this supplement’s amazing effect on longevity. In December 2011 The World Health Organization reported that several batches of magnesium stearate were cross-contaminated with zeolite (sodium aluminium silicate), calcium hydroxide, dibenzoylmethane, bisphenol A and Irganox 1010. While some of these substances may not be harmful, as is the case with zeolite, others are known to be harmful, such as bisphenol A (BPA). The industrial chemical BPA is an endocrine disruptor and has been found to have other harmful effects. The European Union has banned its use in baby bottles and several consumer groups in the U.S. have petitioned the FDA to ban its use in food containers. But whether or not the contaminants found in the magnesium stearate are benign or harmful is not the issue. The issue is that it was contaminated at all. While we don’t know the percentage of supplements in the U.S. that are contaminated, according to a New York Times article “Nearly all of the herbal dietary supplements tested in a Congressional investigation contained trace amounts of lead and other contaminants…” There have also been news stories over the years about contaminated supplements, such as heavy metals in 20 percent of Ayurvedic herbal products tested in the Boston area in 2004. Clearly, contamination is an issue of concern. Do You Know What You’re Putting into Your Mouth? While magnesium stearate is certainly not the only supplement ingredient ever found to be contaminated, the potential for contamination is just one more reason to avoid it. If you do wish to consume supplements containing magnesium stearate, it would be a good idea to ask the manufacturer if they batch-test the supplement for purity. If not, then you really don’t know what you are putting into your mouth. While we believe that contamination is a concern, we do not support stricter government regulations on dietary supplements due to contamination issues. These issues could be much better addressed in the way that we here at Dr. Ron’s Ultra-Pure address it: batch testing. Alpha LipoPotasic Acid: Assay: 99.72%; Loss on Drying: 0.25%. Purity thus tested at 99.97%. Glucosamine Sulfate Potassium: Assay: 99.88%; Loss on Drying: 0.072%. Purity thus tested at 99.952%. Why Buy Dr. Ron’s Ultra-Pure Additive-Free Supplements? 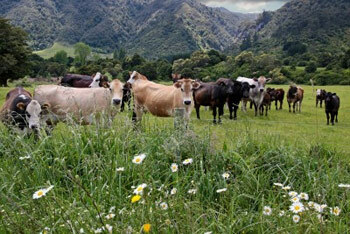 Grassfed New Zealand livestock are the only source of Dr. Ron's Ultra-Pure organs and glands. What is on the label is what you get. Many of our supplements are based on Dr. Weston Price’s studies of the foods that made robustly healthy native peoples disease-resistant, including our organs and glands, cod liver oil and butter oil and ghee. Remember, the sole purpose of using magnesium stearate is to make the machines go faster. Supplements can be made without them – it just takes more time, care and attention to detail. Our exclusive process yields absolutely pure supplements – no lubricants, binders, flowing agents, fillers, dyes or additives of any kind – only the pure nutrients.